Home / ABS-CBN / Susan Roces / teleserye / Susan Roces going back to ABS-CBN? Susan Roces going back to ABS-CBN? After leading the cast of the Kapatid Network's Babaeng Hampaslupa, the Queen of Philippine Moviews, Ms. Susan Roces will comeback to the Kapamilya Network to do her third ABS-CBN teleserye. 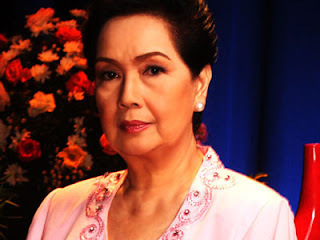 Ms. Susan Roces made several notable teleseryes including Patayin sa Sinsak si Barbara (Abs-CBN) with Kris Aquino in 2007, Iisa Pa Lamang (Abs-CBN) with Claudine Barretto in 2008 and Sana Ngayong Pasko (GMA). This time, as Ms. Roces returns to ABS-CBN, she is said to be part either of the drama series Padre de Pamilya where she'll be part of the powerhouse cast namely Piolo Pascual, Jericho Rosales and Christopher de Leon; or of the TV series version of the 90's hit film Hihintayin Kita sa Langit topbilled by young stars Coco Martin, Julia Montes and ex-Kapuso talent Paulo Avelino.